Here is another interesting thing to see in West Texas. 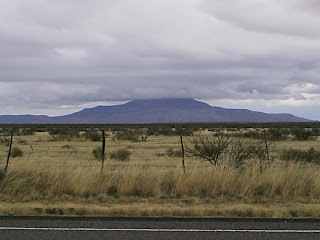 Marfa is near Alpine and Terlingua Ranch. Jim Foreman tells the story much better than I can, so follow this link to his story. 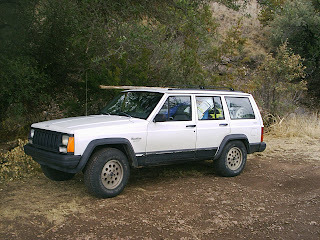 After the Christmas festivities were over, I loaded my Jeep for the trip. Actually I overloaded, this being my first visit to the ranch and not really knowing what to expect. For one thing, I hauled more firewood than necessary. For another, not being 100% sure of the water situation, I erred on the side of caution and brought two full 15 gallon water jugs. Now, these supplies would not have been a bad idea had I had a trailer or at least a hitch-haul, but I found myself temporarily without such equipment and no money left over from the travel budget to purchase same. That meant everything had to go inside, leaving just enough room for me to drive. It also took more time to pack than I anticipated, and I had procrastinated the night before; so that instead of the planned departure at the crack of dawn, I rolled out at about 3 PM, already tired. It was gonna be a long drive. Well, the first day was long. I drove until I got to Texas, then drove until I found a suitable (as in, "with vacancy") motel. By then it was 3 AM. I slept 5 hours, which was a balance between the minimum I felt would allow me to function properly, while still getting on the road early enough to pull down some serious miles. And I did. I stopped for the night in Midland, just as it was starting to rain. It was early evening, and I could have continued to Alpine, but didn't want to head into the mountains at night, in the rain, with unseen 3000 foot drops just off the edge of the road (I know now that the drive is NOTHING like that, but I would have missed some beautiful scenery). of the realtor (OK, I admit it; I bought a tract of land on the ranch sight unseen, on Ebay) but he was out of town so I decided to head south towards the ranch whilst the weather was nice and I had plenty of daylight left. I stopped on the way a few times to snap photos of snow, mountains etc. and, about an hour and a half later, arrived at the ranch itself! I love deserts. 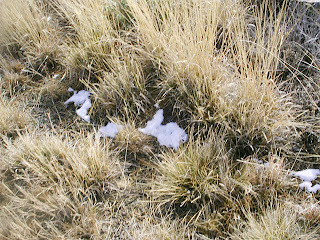 Especially, I love off-the-beaten-path desert areas that have neither a lot of visitors, nor much government intrusion. I have been to southeastern Utah several times, and I love it there, but the area has more and more of both of the above problems. 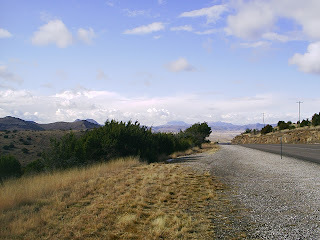 For years I have heard and read the occasional reference or article about the Big Bend area of Texas and how remote and relatively unvisited it is, but I had never managed to make the time to go there; for the same reason so few other people visit: it is not on the way to anywhere. Actually I did once find myself within a couple hundred miles of the area, but I was on my way to Mexico and my time was too limited to make any side trips. 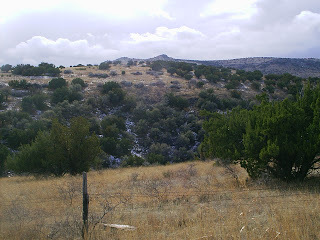 Last summer I saw a reference to a huge old ranch called Terlingua Ranch that is in the area, and I guess it came at just the right time because I decided to look into it further. What I found was a loose-knit libertarian community of folks ranging from the left to the right, politically speaking, but united by a love of freedom and of the beautiful Chihuahua Desert, and by a dislike of crowds and of heavy-handed government. 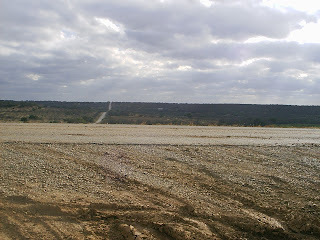 I started searching the Internet, looking for photos, comments, forums, anything about the area in general and the Ranch in particular. I found quite a few photos, member pages of off-road motorcyclists who ride there, and forums of people who own land on the Ranch. And politics, egads. Anytime you have such a diverse group of individualistic characters communicating about the subject that ties them together, a subject dear to all their hearts, you're GONNA have some heated political discussions. IMHO, the thing to do on that subject is to develop some skin thickness and realize we're all allies in preserving the things we love about the area, so I try to ignore the politics and focus on the important part (I said TRY. I've occasionally jumped in with flames too. I'm no angel). While I was doing all this, I was also developing a travel plan to visit the Ranch. I settled on New Year's. I had about a week and a half off work then anyway, and I had a week of vacation time remaining. Also the rattlesnakes, scorpions, killer bees etcetera would be snoozing then. New Year's it was. 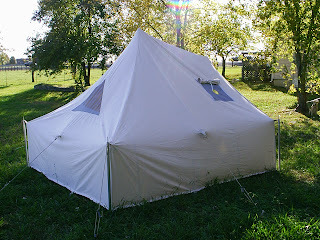 I shopped online and found a good deal on a canvas wall tent. Terlingua Ranch has a lodge, and the prices are reasonable, but there was no WAY I was gonna do such a trip and not camp; and my old nylon tent (or a new nylon tent, for that matter) would not suffice. It had to be a canvas tent that I could stand up in, and heat with a woodstove. I knew of course that I would have to bring my own wood, and that would consume space. Propane would be a lot easier, but a wood fire has certain aesthetic qualities that propane just can't touch. So I searched for a tent-sized woodstove. I found several, but most were costly. I almost decided to buy a surplus Army M1941 tent woodstove, but being a poor boy and an adherent to the Possum Living philosophy I decided to make my own stove. So I went to the steelyard and bought a scrap piece of 8"x8" thickwall square tube and other assorted scrap pieces, then went to a surplus building supply store and bought three 2' sections of 4" double wall, galvanized steel flue pipe to use for a stovepipe. I was in a quandary about using galvanized material because the zinc coating releases a toxic gas if it gets hot enough to break down, but I was thinking that any gas released from the inside of the pipe would exhaust out the top, safely away from the interior of the tent; and the double-wall construction should insulate the exterior of the pipe enough to prevent its becoming hot enough to break down the plating. Then I saw a modern commercially-produced tent stove being sold with an included, galvanized stovepipe, and I quit worrying about it. BTW, the pic of the tent was not taken at the ranch. 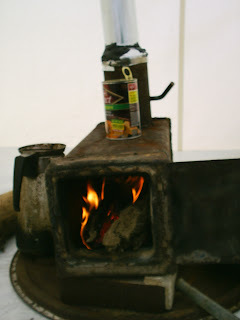 The pic of the woodstove in the tent, however, was. Your contact details will be used only for the purposes outlined on the page where you submitted them and will not be shared with anyone other than our merchant partners for processing your order, if any. Possum Living will not sell, rent or pass on your contact information to any unauthorized third party. We will only contact you for the purposes outlined on the page where you subscribed to the mailing list. This may include monthly newsletters, responses to your requests, or emails regarding information on special offers. You can unsubscribe at any time by clicking on the link at the end of each e-mail message. Software programs called cookies are used by many websites to track your visits to the site. They are stored on your computer and activated whenever you visit the website.If you don't want to receive cookies, or want to be notified when you do, you can program your web browser to do so. This policy may be changed at any time, and changes will be posted on this web page. Welcome to my new blog. I intend to make it, with your help, one of the best sites on the Web for those interested in simple living, self sufficiency (inasmuch as that is possible), and personal freedom. Where it goes from there, we'll just have to see.